Baby handprint crafts are among the most treasured crafts you can make with your kids. Not only are handprint crafts cute, they give you something that you can keep that will always remind you of how small they once were and how much they have grown. Baby handprint crafts (as well as handprint crafts by other kids) are great gifts for Grandparent's Day, Mother's Day or Father's Day. 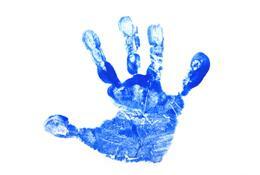 The key to successful baby handprint crafts is getting a full, sharp print or stamp of the baby's hand. Of course if you're just tracing the hand to make a handprint turkey or some similar craft, just getting the child to hold still long enough to trace their hand is required (I'm not saying that's easy). If you're using paint to press a print of the hand on paper, cover the child's hand generously with paint and press firmly, trying to keep the fingers apart so that the hand shape is preserved. If you're making a mold or cast of the hand, make sure the hand is clean and dry, then again press firmly into the material you are using. Try to keep the fingers apart and keep your little one from squirming while you're making your impression. Now that you know how to get your baby handprint, here are some baby handprint crafts you might want to try. One of the most popular ways to preserve a baby's handprint (or footprint) is through the use of a mold. Plaster molds are inexpensive and relatively easy to do. These kits will give you a three-dimensional cast of your baby's hand or foot. If this seems like a lot of work or too much effort for your little one to sit still while the plaster dries, you can just make a mold of the handprint or footprint itself. There are all sorts of kits made especially for parents using plaster or clay in a tin that you simply press the child's hard or foot into to preserve the print. Some kits even come with several tins so you can take a new print each year. A fun idea for framing your first baby picture is using a wide mat and pressing handprints or footprints all over the mat. Then frame the picture as normal. You could also use a single handprint, or one in each corner, to make a framed picture for the grandparents extra-special. Using fabric paint instead or standard acrylic paint, you can stamp a few handprints on a piece of fabric and make it into a pillow or wall hanging. If you use fabric that can be run through your computer printer you can add a poem, birth information or even a picture to the fabric for a one-of-a kind keepsake you'll love to look at. You could also just stamp the handprint on paper. Use handprints to decorate a printout of a favorite poem, put them on the birth announcements (if you have a small number) or use the paper as a mat for a favorite photo. Don't forget to put a handprint and a footprint in your child's baby book as well. And when the kids are older, keep tracing and stamping their hands. I love the idea of forcing a child to get a handprint taken every year, which could then be made into a project that spans their whole time growing up, like a quilt where each square is a handprint on fabric. The possibilities are nearly endless when you start looking at things you can combine with adorable handprints to make your baby handprint crafts.